“The Creator Effect” embraces the concept that we can create anything we desire through our intention and the concept originates in the Quantum principle of “The Observer Effect”. This experimentally proved theory states we affect an outcome just by observing an event and confirms we are the masters of our own destiny. “Intanglement” embraces the concept of oneness, that we are all part of the energy of the universe and that some particles are more entangled than others. By turning the Quantum principle of “Entanglement” into our own personal universe, we can seek and find our other selves. “Everywhereness” works on the Quantum principle of “Non locality”, that electrons can be in more than one place at one time, in fact they are everywhere at once in their awareness that they exist as probabilities until observed. We exist in all dimensions at the same time, beyond though including all linear time zones – these places are where healing and wisdom can be found, to serve the greater being that we are. 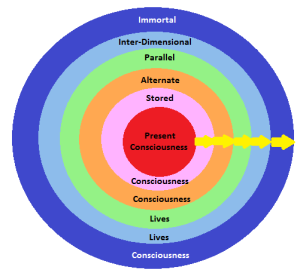 Under these four aspects, the intention for the journey is set and we start in our Present Consciousness, activating the subatomic particles, releasing the restrictions of the conscious mind and offering the present consciousness the sacred role of integration once we return forever evolved from the journey. All offered through the gentle vibrational tones of the voice and energy field of the Facilitator. We first of all expand outwards to explore the Stored Consciousness of the Client. The energy of all our experiences within this life that we know may hold remarkable wisdom or the need for healing. We engage, we explore, we heal, we share. Information reproduced with permission from Quantum Consciousness’s Founder Pete Smith.